Stephen Colbert's return to late-night television—and his Late Show's nightly battle with The Tonight Show starring Jimmy Fallon for viewers, bookings and buzz—grabbed the majority of attention and headlines this month. But tonight's addition to the late-night landscape, the premiere of The Daily Show with Trevor Noah on Comedy Central, could prove to be just as vital: the new show is late night's best chance yet to attract millennials. And that 18-to-34 audience is primed for a late-night satirical news show, according to a new study from Horizon Media's online research community Finger on the Pulse, which looked at the differences between the audiences for traditional late-night talk shows like The Tonight Show and The Late Show and satirical programs like The Daily Show or Last Week Tonight With John Oliver. While 43 percent of adult viewers say they've watched traditional late-night shows, only 20 percent say they have tuned into satirical news programs. But among millennials (age 18-34), 32 percent say they've watched a satirical news show, compared to 23 percent of adults 35-39, 13 percent of adults 50-64 and 11 percent of adults 65 and up. As the first millennial host, Noah holds particular appeal to that demo. He is 31, a full two decades younger than his Daily Show predecessor, 52-year-old Jon Stewart. The next youngest late-night host, Late Late Show's James Corden, is 37. "Comedy Central has done something very smart. They've brought in a host who breaks the mold in a couple of ways," said Kirk Olson, vp of TrendSights at Horizon Media. "First, because he's younger and he's of the generation that they're targeting. And also, because he's multiracial. Everyone's seen the statistics: Millennials are the most multiracial generation in U.S. history. They really do see race and culture and ethnicity as something central to what sets their generation apart. And they're looking for a point of view that feels authentic in that way, in that multiracial, multiethnic, global kind of tone." Viacom is pulling out all the stops to catch as many of them as possible tonight: the company is simulcasting tonight's premiere across all its major networks, including MTV, VH1, Spike, BET, Nick at Nite, MTV2, MTVU, Logo and others. The Horizon Media study, which polled 3,000 people reflective of the U.S. population, found that of those who watch satirical news programs, 55 percent say they tune in because of the show's "irreverent humor," while 36 percent cite "topical conversation and debate." Political content (26 percent) and edgy tone (25 percent) also drove tune-in. At the bottom of the list: celebrity interviews, which just 18 percent cited. That's an important point, given the subdued response to Noah's first week of Daily Show guests: Kevin Hart will be up first tonight, followed by Tinder co-founder Whitney Wolfe on Tuesday, Gov. Chris Christie on Wednesday and Ryan Adams, who will be performing a song from his cover of Taylor Swift's 1989 album, on Thursday. But A-listers aren't the draw for fans of satirical news shows. "It's about how he digs into topical conversation. It's great if there are A-list celebrities doing that with him, but this audience is looking for guests who again break that mold and represent a different take on what's important in culture and what's topical," said Olson. "That's why the satirical news shows have done well by booking guests who are leaders in business, politics or nonprofits. This audience, as an audience that's globally engaged, is fascinated by the stories of these people that we don't necessarily hear about every day, in the mainstream pop culture news, or on the typical late-night show." And Noah's cutting-edge comic style should mesh well with that audience. "Millennials are more accustomed to a much more pointed form of humor," said Olson. "At that life-stage, that twentysomething/early 30s life-stage, it's common for people to want an edgier and more satirical type of humor." Comedy Central hopes that Noah can help keep The Daily Show among the top late-night earners, as it has been for the past several years under Stewart. While no one expects Noah to match Stewart's audience and influence from the start, the network's gamble could still pay off in the long run. "Comedy Central didn't try to find another Jon Stewart," said Olson. 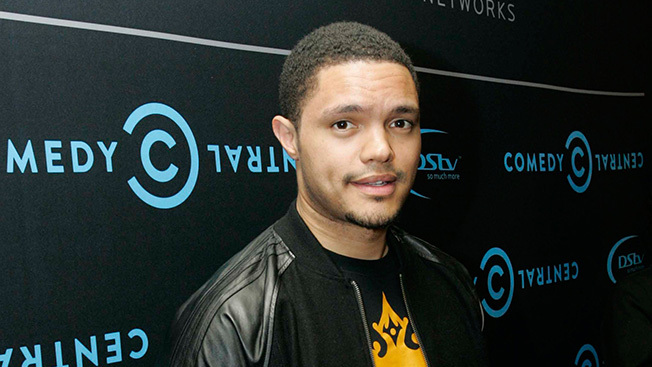 "It's clear that Trevor Noah is a different person. He's not the typical late-night host, and he is very well aligned with some of these things that the millennial audience values."